If it's a holiday weekend in Canada, you can know that a whole whack of people are making a pilgrimage to Sauble Beach, Ontario. That was certainly the case once upon a time, when George Mercado and I took our youth band and drama team to perform in the bandshell on the beach, on the July long weekend. There are actually several different storylines that could be explored out of the events of that single weekend, but the one that comes to mind as I begin to revisit a recent classic (Lifestyle Evangelism) is the story of a young couple, whom I'll refer to as Jack & Diane (any John Cougar Mellencamp fans out there?). I had met Diane many years earlier, and our last conversation had been about the Bible college she had chosen to attend -- it was well-known for its extremely narrow and legalistic approach to faith and culture. I was both intrigued and concerned that Diane felt she should attend this particular school. Now, roughly six years later, as the band & drama team was performing at Sauble Beach to a rowdy and somewhat inebriated crowd, I had a chance meeting with Diane and her husband Jack. Jack & Diane referred to themselves as "back-slidden" quite freely, but they were intrigued by the band and drama team's simple yet clear commitment to faith in Jesus Christ. A few months later, Jack & Diane began attending our church. Wendy and I had numerous conversations with Jack and Diane, over the few short months that we had contact with them. As I had guessed, their experience at the extreme Bible college had shaped and discipled them, just as Diane had hoped it would. Well, perhaps not just as she'd hoped. The school had basically turned them into good little Legalists, bound by draconian rules and regulations that had been added to the simple message of the Gospel. And after graduating, neither Jack nor Diane were able to keep up the religious performance in the "real world". So, they simply gave up. But at the same time, they couldn't stand our church. They liked us. They liked George. They liked pretty much everyone they met. But they struggled mightily with living in a grace-filled church. They were incapable of faith without (excessive) rules. They couldn't separate the two. 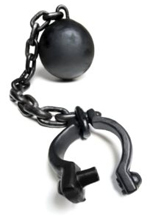 It was either faith(+ legalism) or no faith. Their experience at that Bible college had poisoned them so thoroughly that they simply could not feel that they were truly "Christian" unless they were following all of the school's (man-made) rules. So they quit our church and cut off all further contact with us. Jack and Diane may be an extreme example, but I know a lot of people who have experienced the same conundrum: they can't separate the wheat from the chaff, spiritually speaking. And so, they turf their faith and embrace... whatever. It's been a while since I've last read Lifestyle Evangelism, but I seem to recall that it had a lot to do with getting past (unbiblical) cultural barriers and engaging people where they were at. As George Mercado used to say, "earning the right to be heard". And there have been no shortage of books on topic of sorting through issues of faith & culture -- ie. John Fischer's Real Christians Don't Dance and True Believers Don't Ask Why -- so what gives? Why are so many people unable to separate the chaff from the wheat? Looking forward to perhaps finding some answers as I begin revisiting Lifestyle Evangelism. There was a moment of silence around the table - a very brief moment - as the Barista placed the brightly decorated dessert in front of me, with understated but undeniable ceremony. It came as a surprise to no-one that it was the Younger who first broke the silence. "A long time ago, in a galaxy far, far away..." he intoned with mock seriousness, unable to contain himself any longer. "Has it really been ten years already?" asked the Elder rhetorically. "You've been blogging for an entire decade?" I was still somewhat in shock over the surprise gathering at The Genesis Cafe for this anniversary-of-another-kind. I could only gesture to the chocolate cake in front of me, pointing out the "Happy 10th!" message in bright red icing. "It doesn't seem like it," I conceded to the Elder, "but cakes don't lie!" Looking up at the Barista, who was hovering nearby with a pleased expression on her face, I hastened to thank her. "This is completely unexpected, but you've done a fantastic job - probably on short notice, if I know my friends here!" "Naw, I had at least 24 hours of warning," she replied innocently, "and it was my pleasure. I'm always up for an excuse to celebrate with friends." And with that, she disappeared behind the counter in the crowded cafe, ready as always to serve the people lined up at the espresso bar. "Did I hear you correctly," asked the Elder, as the three of us closed ranks around our little table. "Are you intending to blog your way through a few books from yesteryear?" "You could always do another Can of Worms series," suggested the Younger, as he teased a bit of icing off the cake with his fork, the hint not at all subtle. "I'll leave worms out of the picture this time," I laughed, as I began to cut the cake and divvy out portions onto the waiting plates. "But yes, I am planning on blogging through some older books. Just revisiting roots and examining the journey. It's been quite a trip, from detoxing from church, through Post-Charismatic, and to now." The Elder chuckled as he began cutting into the piece of cake before him. "Ah yes... Post-Charismatic. I seem to recall that you got into some hot water with a few 'revivalists' over a bit of imaginative artwork that you created." The three of us paused, forks at varying levels of engagement, as we smiled knowingly at the Elder's recollection. "To be honest," I replied, gesturing with my fork (but gently, so as not to fling cake crumbs all over), "I was expecting more push-back for writing Wormwood's Apprentices, but you can never tell which blog post will strike a nerve." We were pleasantly interrupted by the return of the Barista, who appeared uncharacteristically unsure of herself. The Barista stepped aside to introduce the couple trailing her to the table, and both the Younger and the Elder almost dropped their forks in shock. "Would you be savin' some o' that cake for the likes of us?" growled the Barkeep, grinning crookedly as he stepped closer to the table. His wife and business partner, the Proprietress, smiled in a noncommittal fashion - the unpredictable antics of the Younger and Elder in her pub probably foremost in her memory. "Your young friend insisted that we stop by," she said brusquely, nodding towards the Barista, who again hovered nearby to see what might come of this unexpected meeting. The three of us abruptly came to our senses, and we hastily made space at the table, the Barista adding two - no, three - additional chairs to our gathering. "My shift's over," she said by way of explanation as she cheerfully joined us and helped herself to some of the cake she'd baked. "And I knew from hearing these two talk," - she gestured towards the Younger and the Elder - "I thought I should invite the pub owners as well." The Proprietress rolled her eyes, although she graciously accepted an offering of chocolate cake from the suddenly-meek-and-speechless Younger. "You have no idea how many stories I've heard after work from my husband." The Barkeep chuckled to himself as he devoured a generous helping of what remained of my celebratory dessert. "Well," he offered, swallowing mightily, "I know ye often visit other drinking holes fer those talks of your'n. But truth be told, I'm kinda partial to having two men o' the cloth talking shop in my pub." "Thank you," the Elder said quietly, choosing not to make any attempt at explaining that neither he nor the Younger were clergy. "We do enjoy discussing our faith wherever we happen to find ourselves, even driving around, or having breakfast at a roadside diner." "But our reason for gathering today," concluded the Elder, skillfully turning the conversation in a new direction, "was simply to reflect, reminisce, and celebrate a decade of blogging." "Hear, hear," agreed the Younger enthusiastically, raising his coffee cup in tribute while the Barista smiled her infectious grin. "Is there anything you wanted to say on this auspicious occasion?" the Elder prompted me, likewise raising his coffee mug and clinking it against the Younger's. The Barista enthusiastically copied the gesture. Even the Crusty Irish Barkeep and the Proprietress - after a brief moment's hesitation - joined in. "Quotes? Comments? Visionary insights?" Raising my own mug, I wracked my brain but was unable to produce any thoughts that seemed worthy of the occasion. "Well," I began finally, clinking my mug along with theirs, "I guess I'll just say thank-you for joining me on this journey. I'm incredibly grateful for everyone who has read this blog, maybe left some comments, or sent me emails because of something I'd written. It's an honor and a pleasure. And the best part is - the finish line is not yet!" The Barista's head bobbed up and down as she flashed her widest grin. 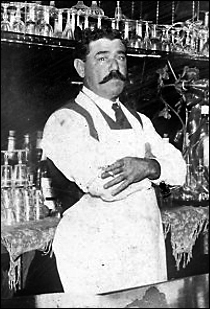 The Barkeep nodded at me in all seriousness, while the Proprietress relaxed long enough for a small smile to flit across her face. The Younger clapped me on the shoulder - harder than he realized, I think. And the Elder just sighed one of his contented sighs as he took in the camaraderie unfolding around him, a kind and fatherly expression on his face. 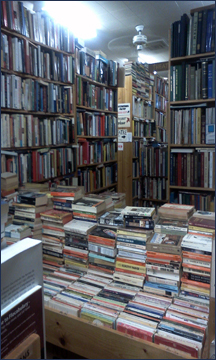 "We are such nerds," my wife Wendy commented ruefully, as we entered the labyrinth-like used book store. And she had a point: with all the things that we could have been doing on BC Day in sunny Penticton, our greatest delight was finding a used book store. I reminded her that we had done the same thing on our honeymoon - browse for several hours in a used book sale in Winnipeg. And my big score back then had been discovering a used copy of Bob Girard's out-of-print Brethren Hang Loose. I was looking at a historical progression in the types of books that Christians have written -- and read -- over the past few decades. Early Christian publishing seemed to mostly be about creating Bible and theological study aids for people who wanted to deepen their understanding of their faith. Not coincidentally, Christian publishing houses -- unlike today -- were owned by Christians. 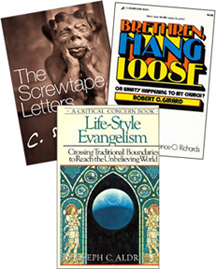 During the 70's, there were books like Bob Girard's Brethren Hang Loose and Francis Schaeffer's He is There and He is Not Silent (a book which marked the turning point in Wendy's spiritual journey into Christianity), but there were also many "the end is coming soon" types as well. It was a reflection of the times: even secular society anticipated nuclear war and/or environmental disasters. Movies of that era were equally apocalyptic: Towering Inferno, Jaws, Frogs, Earthquake, Airport, The Swarm, The Posieden Adventure, The Hindenburg, and The China Syndrome, etc. 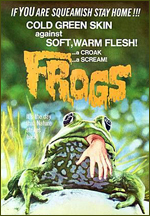 Movie tag line: "The day Nature fights back!" No wonder the original Star Wars was such a breath of fresh air back in the day: good triumphed over evil for once! 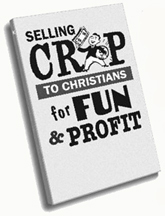 Christian books shifted in the 80's, both good and bad. There were lots of warning books about a variety of boogie-men (the New Age Movement seemed to be of considerable interest) -- it was almost as if the apocalyptic end-of-the-world types had to point the finger of impending doom somewhere. Christian counseling books also became quite popular, as did an exponential growth in the number of (how else do I describe it in a short-but-admittedly-generalized phrase?) 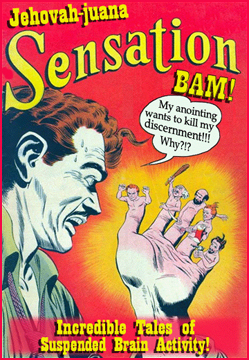 what amounted to Christian self-help books. In the non-Christian world, we had "power-everything": power suits, power ties, power drinks, and power lunches. And in Christian publishing, (as any Vineyardian worth his/her salt would know) Power Evangelism, Power Healing and Power Points by John Wimber. Keith Green (1953-1982) lamented loudly in the late 1970's about what he called "Jesus Junk" (note: Keith's lament preceded the WWJD fad); and for those of us old enough to remember, Christian bookstores used to be predominantly full of BOOKS, with a small collection of Christian records (later cassettes), cross necklaces and a few creation-versus-evolution bumper stickers. The Jesus Junk phenomenon has only increased in the past few decades, crowding out most of the books. There is even a Jesus Junk website that gives examples of just how bad it's gotten. And what if I were to blog my way through one (or more) of these books? After more than a decade of books telling us everything we knew about church, theology and even the gospel was wrong -- resulting in something that strangely resembles "all the people did whatever seemed right in their own eyes" (Judges 17:6 NLT) -- isn't it about time to (re)discover what Christians used to actually do believe? I bought the used copy of Lifestyle Evangelism. Much like discovering the out-of-print copy of Brethren, Hang Loose in Winnipeg all those years ago, I suspect that God has something to highlight that may have gotten obscured in recent years.